November and December are the best months to see the scenery along Utah’s roads. Residents and tourists alike await the fall colors on Mount Timpanogos and the snow dusting Mount Olympus. But these views are becoming more scarce. We didn’t take an official survey, but everyone we spoke to—100% of those polled—said they would prefer to see mountains instead of billboards. So why are our view corridors becoming obstructed and more scarce? It seems the problem boils down to a question of ownership. Airspace and airwaves are a tricky issue. For example, take the television model. The TV airwaves have to be licensed from the Federal Communications Commission to broadcast programs to viewers. The reason is that the electromagnetic spectrum is limited and its bandwidth scarce. To pay for programming, the networks sell ads. We enjoy the program, we watch the ad. It’s a fair deal. In like manner, then, did Reagan Advertising and Yesco pay for ownership of our view corridors and the airspace their billboards inhabit? If so, then we thank them for their generosity in allowing us a few small pockets between billboards when we can see the mountains. But wait a minute, there is something wrong here. They don’t own the views and they aren’t financing our highways anymore than any business. View corridors are a scarce commodity. If they weren’t, then they couldn’t sell the ads on their boards. Billboard companies don’t buy airspace. Instead they purchase a very small amount of land from landowners and influence over our Utah politicians. This way they can make money on something nobody wants to see by persuading politicians to pass zoning changes that voters certainly wouldn’t. But attempts to eliminate billboards has proven very difficult in the United States. Back in the 1960s, everyone was getting tired of billboards blocking beauty in America. The First Lady, Lady Bird Johnson, started a campaign to beautify America. Her initiative included planting more flowers in public spaces and a removal of billboards and junkyards from the nation’s highways. She believed that beauty can improve the mental health of America. At the time Doug Snarr, owner of Snarr Advertising, lobbied the government to pay him to take down his billboards. Part of a $50 million a year beautification budget was set aside to do just that. $15 million was designated for billboard removal. Snarr retired from the payoff he received to remove his billboards. Most billboards came down and our highways and corridors views were free of unsightly advertising. I-15 offered vast expansive views of the Wasatch Range. But then slowly the big signs and billboards began to sprout back up. Why? Residents didn’t want them, Lady Bird didn’t want them, but some of our Utah politicians and other Congress members wanted to allow for a loophole. The loophole was further supported by towns that wanted control over their freeways and highways in attempt to attract motorists traveling too fast to see their offerings. An amendment was tacked onto the National Highway System Designation Act in 1995 to a subsection of the Highway Beautification Act of 1965. This gave states the flexibility to exclude from state or national scenic byway designation any segment of road that doesn’t meet the scenic byway criteria. So the billboards creep back in. And today they are used much less to advertise the offerings of small towns and much more to advertise to commuters in urban areas. Some fetch upwards of $5,000 per month. But billboard companies realize they must pay the piper. One of the largest campaign contributors to Utah politicians is Reagan Advertising. They lobby heavily for billboard placement. Billboard corporations and the businesses that use them for advertising strongly oppose any government effort to limit signs. Mayor Ralph Becker and the Salt Lake City planning office are constantly fighting against billboard placement and digital billboards. Other cities have followed suit. When Murray City recently turned down Reagan’s request to convert one of their existing billboards to a digital billboard Reagan filed a $300,000 lost revenue lawsuit against the city. The amazing growth of the unsightly billboards near the canyons and along the I-15 corridor is a clear example of the power of special interests to influence our elected leaders. We don’t want billboards, but our politicians are receiving a lot of money from companies who do want them. So who wins? Sen. Orrin Hatch has received thousands of dollars over the course of his political career from Reagan Advertising, which gives generously to politicians on both sides of the aisle. According to the website Follow the Money, Reagan contributed $143,404 in 2012 with 21.22% going to Democrats and 78.89% going to Republicans. Between 2011 and 2012 it was the second biggest special interest donor to incoming Utah legislators. And though Provo, Ogden, and Park City have banned any new billboards they still seem to be everywhere. It could be argued that the I-15 corridor is not scenic, so therefore billboards should be allowed. Lining the freeway are mostly urban views from Ogden to Provo. But our greatest asset living in Utah is our mountains. Our pride as Utahns comes from the beauty of our mountains. It’s an embarrassing shame that the largest path leading into Salt Lake City (I-15) hides our mountains. Instead we see a path awash in consumerism and annoying messages. On nice days the Wasatch Mountains rise on the east and Oquirrh Mountains grace the west. Utah Lake and Great Salt Lake are visible for miles. Past Provo open spaces and rolling hills line the freeway and eventually give way to desert landscapes and rock groupings. Could I-15 benefit from a more scenic approach? Not everyone is annoyed by billboards. Like the old Burma Shave and Little America road signs breaking the monotony of a long drive, they can give drivers something to look at and look forward to. 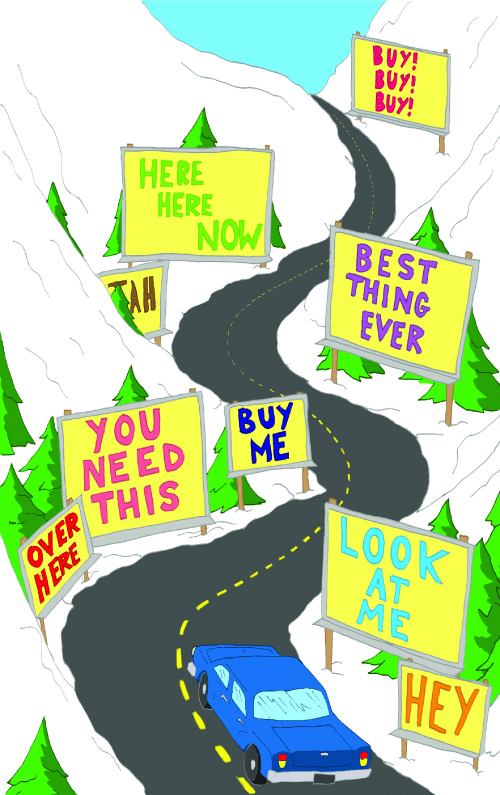 In the 1950s, cross country drivers watched anxiously for the entertaining Burma Shave signs. “No matter/How you slice it/It’s still your face/Be humane /Use/Burma-Shave.” Driving across Wyoming without even a rest stop in sight, the Little America signs promise clean restrooms and 50-cent ice cream cones while drivers count down the miles with building anticipation. Getting off the freeways and population corridors to explore small towns and out of the way attractions is a good way to avoid billboards. Billboards are banned on National and State Scenic Byways. If they do appear on designated scenic byways, a report to UDOT will quickly take care of the problem. Some states have outlawed billboards all together. Currently Vermont, Alaska, Hawaii and Maine have banned billboards in their state. They are all states anyone would consider scenic and Utah ranks among the most beautiful in the nation. Perhaps it is time to clear the view and let the scenery speak for itself. Editor’s additional note: Lady Bird Johnson believed that beauty can improve the metal health of a society. More anti-depressants are prescribed to residents of Utah County than any place on earth. If Lady Bird Johnson’s theory is correct, than billboards and the unsightly constant distractions that commuters are inflicted, could be directly tied to Utah’s depression epidemic. If there is anything that politicians can do that is good, it would be to look after the health and well-being of their constituents. We do not believe allowing the billboard companies to influence their decisions through campaign contributions contributes to the overall beauty, health or well being of residents along the Wasatch Front.